I'm grilling again on this Tasty Tuesday! We have fantastic neighbors. And sometimes they want to borrow our grill which means we have a hot grill to share and some time to chat while we wait. It is such a luxury to be able to cook a full meal while not heating up your kitchen during these summer months. Grilling is the best. This side dish is perfect for the grill and perfect for your July 4th picnic or grilling party! I made a small version of this dish because I was in a hurry. But you could double your amount of orzo and veggies and have a huge side dish for a party. 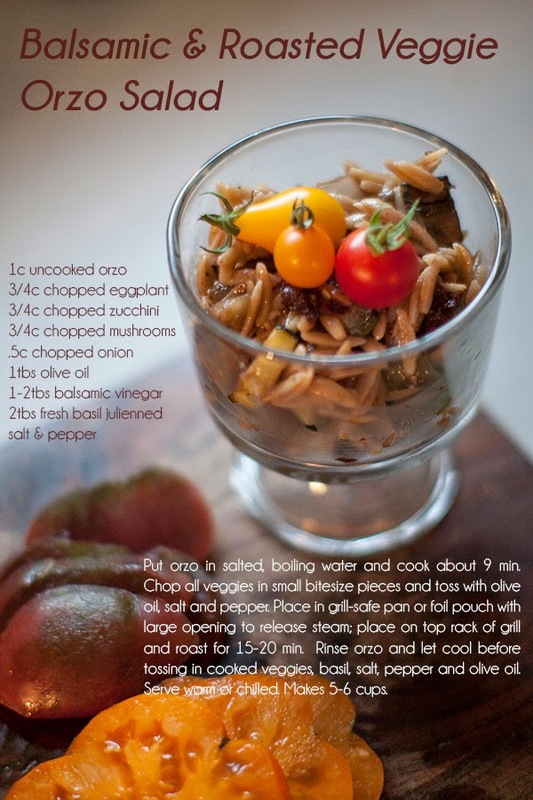 You will probably notice that you do not use all of your eggplant and zucchini with this recipe and that is because I didn't cook enough orzo to support all the grilled goodness. Just grill everything and cook more pasta. Or, as I will do, cook the extra veggies and use them for another dish like veggie lasagna. And toss some cherry tomatoes in with your veggies about 5 minutes before they are done to have some yummy pops of color in your dish. Throwing in some feta or mozzarella cheese is never a bad idea! Yum. Enjoy your fresh sides this holiday week! Happy and safe celebrations to you all! P.S. Need a refresher on photographing your fireworks displays this week? I shared a few tips last year that might be helpful.